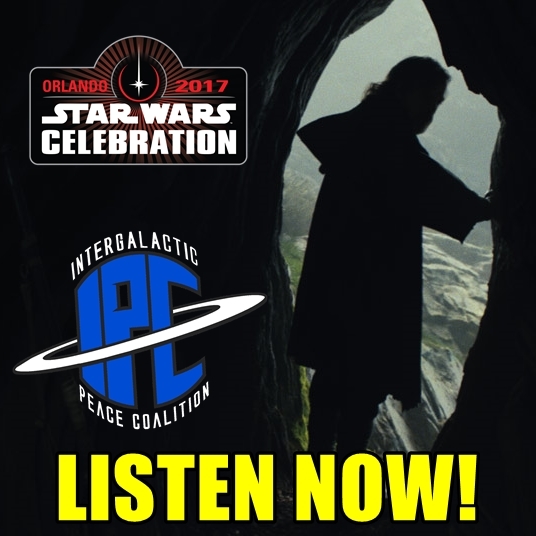 On this episode of the Intergalactic Peace Coalition Podcast, Ben is joined by frequent guest Jake Damon and newcomer Patrick Bonfrisco to discuss their favorite memories from Star Wars Celebration Orlando 2017! They share their experiences waiting in line all night to see amazing events such as the 40th anniversary panel and the Star Wars: The Last Jedi panel. Additionally, they break down the stunning teaser for The Last Jedi, as well as the trailer for the fourth and final season of Star Wars Rebels, and the official reveal of Star Wars Battlefront II. Furthermore, the guys talk about who they met, what they bought, and what they ate(#BBQWatch!). Listen for all that and much more!